Where do I use my Deramores voucher code? Enter your code on the checkout page as indicated above. Discover a huge array of yarn in various different weights and fibres, a selection of colour and value packs, crochet and knitting packs, crochet, digital and plus size patterns as well as free patterns and pattern books. As well as this you can also find different types of knitting needles and crochet hooks in different materials as well as plenty of affordable products in the clearance section. All these knitting and crochet items are available from top brands like Patons, Peter Pan, Rico Design, Rowan, Scheepjes, Sirdar, Stylecraft, Sublime, West Yorkshire Spinners, Wendy and Yarn Stories. At Deramores you can also discover designer shops from names like Amanda Perkins, Blue Star Crochet, Carmen Heffernan, Fluff and Fuzz, Hand Knitted Things, Julie Yeager Designs, Knitables, Martin Storey for Rowan, Patchwork Moose, The Cornish Knitting Company, The Patchwork Heart, WJP Knits, WoolInHook and many more. If you’re looking for additional information and knitting and crochet tips and tricks check out the Deramores blog. Here you can find an array of articles on things like customer satisfaction surveys, Indian Summer patterns, Deramores competitions and giveaways, Dera toys that make the perfect Christmas presents, if crochet hooks and knitting needles are allowed on planes and much, much more. Browse through pages and pages of articles and blog posts and discover tons of advice on a variety of topics like Christmas and chunky week, you can also discover tutorials on things like Christmas decorations as well as knitting groups and range reviews. Polyamide, 100% Bluefaced Leicester Wool, 100% Merino Wool, Mohair, Yak, Merino, Cotton, Wool, Nylon, Silk, Acrylic and Cashmere. Knitting yarn in the clearance section is also available in different weights for adults, children, babies, dolls and toys and for various garments like sweaters, cardigans, hats, scarves and jackets. What is your delivery information? UK delivery is £2.95 or free on orders over £15. You can return a products to Deramores within 30 days of delivery. You can submit a returns request here. How can I contact Deramores? To contact Deramores please use the contact form. Deramores is the UK’s leading online, award-winning knitting and crochet retailer. 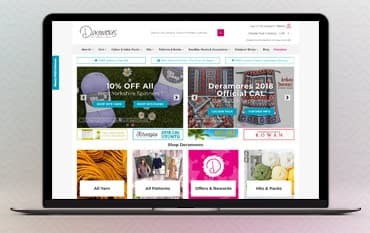 Founded in 2010, Deramores continue to source, curate and create the highest standard of choice, value and service to knitters and crocheters worldwide. With yarn, patterns, kits, needles, hooks, accessories and much more, you can find all you need from top brands like Patons, Rowan, Stylecraft, West Yorkshire Spinners and Yarn Stories, and with a discount code or deal from us, you can enjoy incredible savings on all these products too.